Four Knights Film - 120 min. Principal Cast: Cliff Curtis, James Rolleston, Kirk Torrance, Miriama McDowell, Baz Te Hira, Xavier Horan, Wayne Hapi. Crew: Screenplay: James Napier Robertson; Cinematographer: Denson Baker; Editor: Peter Roberts; Original Music: Dana Lund; Production Designer: Kim Sinclair; Costume Designer: Kristin Seth; Sound Designer: Nick Buckton; Art Direction: Jill Cormack; Set Decoration: Daniel Birt; Producers: Tom Hern, Jim Marbrook; Director: James Napier Robertson. This is a true story based upon the life of chess champion Genesis Potini. It is also a film about two lost souls finding the strength to carry on through each other's company and believing in themselves, even if no one else does. The film connects chess, its rules and strategies with elements of Maori mythology and spirituality. Since his childhood Genesis has always known chess as “the warrior game.” In teaching the kids at the local chess club the principles of the game he draws on Maori creation stories. For the at-risk youths, Genesis' chess lessons serve not only as instruction in the game but as important lessons in cultural identity as well as more general life lessons about living in a community. Definately Recommended. Starting 10 December 2014, a PAL R4 dvd can be purchased from AU and NZ sources for about $30. It is presented in its original 2.35:1 format, 16x9 enhanced, with a DD Surround 5.1 English language track. There are optional English subtitles. There are two extras: 'Behind the Scenes' (9:49) and 'Gisborne Premiere' (4:44). These extras are presented 1.78:1 with no subtitles. An R2 DVD version, with optional English subtitles and the same tech specs as the NZ one, is available from the UK for about 16#, and some other European sources, starting 10 August 2015. Starting 12 July 2016, an NTSC DVD version is available in the US, selling for about $20. It has the same tech specs as the NZ one, but with spoken English and dubbed Spanish language tracks and optional English and Spanish subtitles. There are 11 trailers, four of them are front-loaded. There are no other extras. 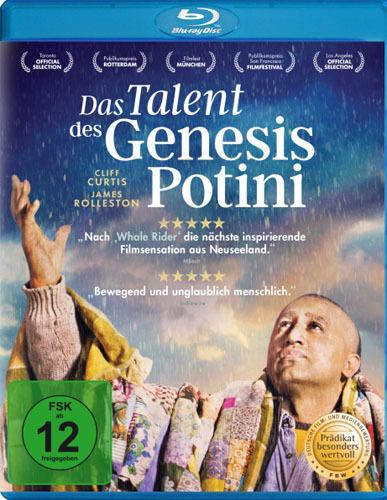 Starting 10 November 2016, Blu-ray and DVD versions were released in Germany, titled 'Das Talent des Genesis Potini', with spoken German and English tracks, selling for about 20eur. The Blu-ray is a Region B 1080 50p with DTS-HD MA-5.1 tracks and optional German subtitles. Extras: Original English trailer (2:01), German Trailer (1:57), Pre-roll - short trailer (:37), Behind the Scenes gallery stills(1:21) and three unrelated German trailers. Dec. 2014 - New Zealand Film Awards 'The Moas' - Best Film, Best Director, Best Actor (Cliff Curtis), Best Supporting Actor (James Rolleston), Best Screenplay (James Napier-Robertson), Best Score (Dana Lund).